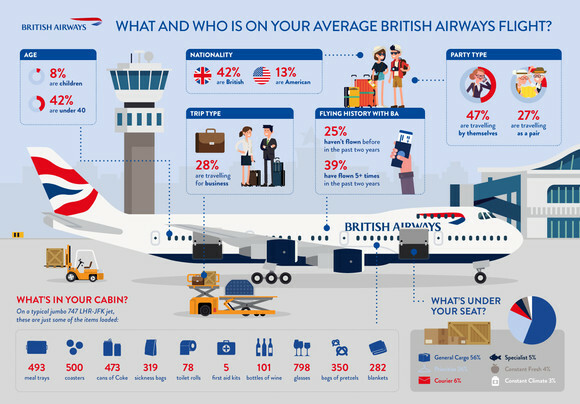 LONDON, UK, 2018-Aug-13 — /Travel PR News/ — As the summer holidays reach full swing British Airways has released data revealing exactly what, and who, is on one of the airline’s 850 flights a day. *The customer study looks at data from January 1 – July 31 2018, across the airline’s network. Naturally data will vary by route. **Data taken from IAG Cargo from January 1 – July 29, 2018. Accounts for all data across the IAG Cargo network. This entry was posted in Airlines, Flights, Travel, Travel Services, Travelers and tagged British Airways, Carolina Martinoli, flight, infographic, pretzels, wine. Bookmark the permalink.